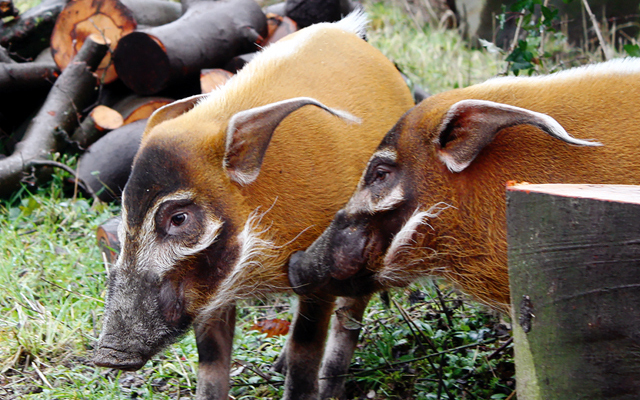 Wild Place Project is home to two troublesome red river hogs. Instantly recognisable for their bright red fur, the red river hog is undoubtedly the most brightly coloured of all wild pigs. They have black legs, a tufted white stripe along their spines and white ‘spectacles’ around their eyes. The boys love to snort and, despite their size, are very fast little runners. Like all young boys, they love digging in the earth and can be found searching for food, using their large wedge-shaped head to quickly root up tough vegetation. They will also greet each other by blowing their breath on the other, which may not be that pleasant first thing in the morning. Red river hog originates from Western and Central Africa. They weigh an average of 45 – 120kg and stand at 0.55 – 0.80m tall. The omnivorous red river hog eats a wide variety of food, from roots, fruit and grass to eggs and small animals. Being highly adaptable, red river hog can be found in forests, savannah woodland and even cultivated areas, where they are perceived as agricultural pests. Red river hog is relatively widespread and, although they are one of the most hunted species in the Congo for bush meat, they are currently listed as a species of least concern. You can learn more about the red river hogs' conservation status on the IUCN Red List of Threatened Species website. Wild Place Project holds the European Endangered species Program (EEP) for this species.